I look at him a moment, scanning his eyes, wondering if he is being truthful. Then I look down at the plate to check if he’d eaten the right thing. 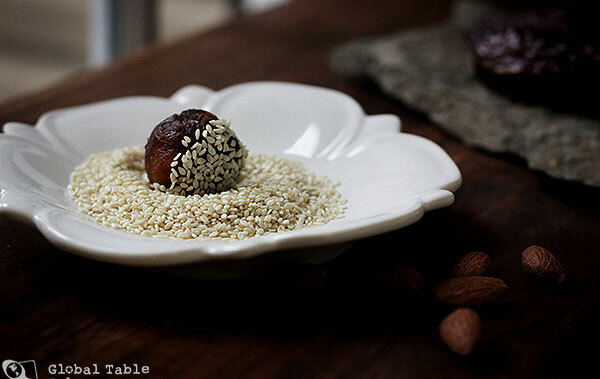 Sesame coated, almond stuffed dates. Could he really think the Stuffed Date Balls are good? To be fair, he had no idea what they were when he ate them, except I did warn him that the crunchy thing inside was an almond. Still, these date balls seem more challenging to me than sushi, more challenging that the raw beef soup for Laos, more challenging than the frankincense ice cream. More challenging for me, at least. We all have our difficulties when it comes to certain textures and flavors. And dates have always been mine. Could it be that we project our fears onto our friends and families, expecting them to react the same way we will? If so, no one has a chance. The favorites have been decided before anyone takes a bite. The funny thing? By keeping my mouth shut, I was able to witness Keith’s delight, which in turn encouraged me to give the date balls a new shot. And guess what? This week I liked the dates, too. That’s the second time this adventure showed me how dates can, in fact, be good. 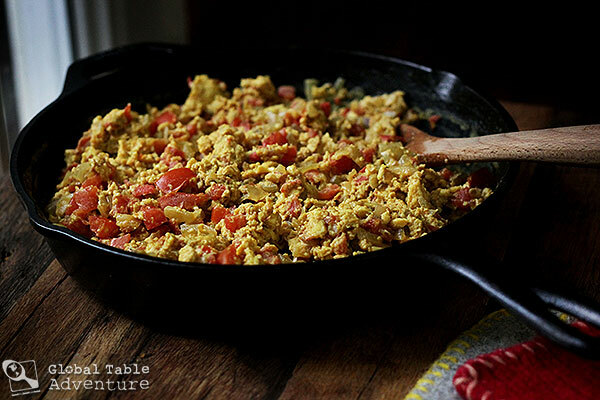 I enjoyed trying this spicy, scrambled version of shakshouka. While the saucy one will always have a near and dear place to my heart, this one got great reviews from Keith and Ava as well. I particularly enjoyed the cumin and spicy chili pepper, which gave the eggs kick (I think they’d be great for Father’s Day!). If you have about a tablespoon of tomato paste to spare, it adds a nice depth of flavor to this dish. Everything. This one is easy to make, vegan, pretty, and tastes delicious. The combination of dates and nuts/seeds is very PB&J, which is aces in my book. If Keith likes it (and I learned to like it), then anyone can. Nothing. Just be sure your almonds and sesame seeds are fresh. Remember, they go rancid after sitting too long… and you don’t want off flavors to ruin this treat. “Dates are among the most ancient of fruits, growing along the Nile as early as the 5th century B.C. 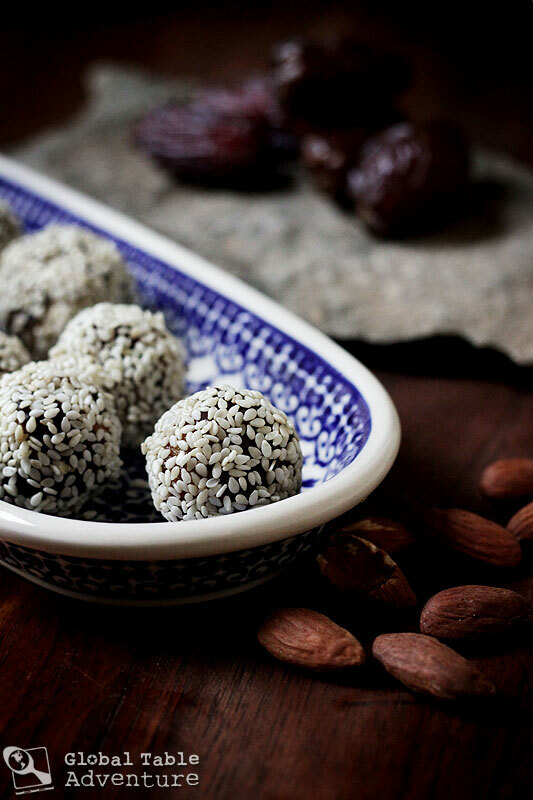 Perhaps the Egyptians knew dates’ sweetness hit a bounty of nutrients. Dates are nuggets of nutrition that satisfy a sweet tooth, making them ideal snacks to stave off hunger. True, dates provide more calories than most fruits, but they make a great substitute for processed sweets, like candy, to help you stick to your weight-loss routine. ha 🙂 Date night indeed! I made pita bread yesterday for the first time–thank you for inspiring me to try new things. It had nice pockets to stuff those simply made spicy scrambled eggs. We all enjoyed dinner last night. You are amazing, Janet. Were you at the Philbrook event? Such a wonderful Ava video!!! 🙂 love her outfits and accessories and of course the new word!!! Thanks for sharing!!! And I guess part of your mission definitely seems to be accomplished: Ava is a fearless and non-picky eater!!! Yay!! I love your lessons of the week, they always get me thinking. As I am doing my own global table adventure the lesson this week has inspired me to not be so hesitant with eating and cooking my meals. Thanks.